Growing up: A Back to the Roots kit. Nikhil Arora, 25, and Alejandro Velez, 24, didn't plan on being mushroom farmers. In 2009, during their last semester at the University of California, Berkeley, Arora lined up a corporate consulting job and Velez nabbed one in investment banking. But a lecture on sustainability in a business ethics class changed all that. Their professor mentioned that he had heard it was possible to grow edible mushrooms in recycled coffee grounds. "No one had ever taken that idea and done anything with it commercially," Arora says. Intrigued by the idea, the students took to Velez's fraternity kitchen, where they set up 10 paint buckets of used coffee grounds fertilized with oyster mushroom spawn. Ten days later, they had sprouted their first crop. They conceived a business, fueled by a $5,000 prize from a campus innovation competition that allowed them to buy a van and rent a 200-square-foot warehouse. "At that point, that was like giving a million dollars to us," Arora recalls. Two weeks shy of graduation, Arora and Velez nixed their plans to join corporate America. They spent the summer couch surfing and giving themselves a crash course in urban farming, tweaking variables like humidity, air flow and temperature. The investment paid off. 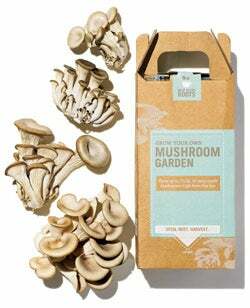 That October, they sold their first mushrooms to Whole Foods Market in Berkeley. "We still have that invoice on our wall," Arora says. Soon they branched out into manufacturing and distributing indoor grow-at-home gourmet mushroom kits using recycled coffee grounds as "soil"; this became the basis for their company, Back to the Roots. "We started off doing the fresh mushrooms, then both the mushrooms and kits, and now just the kits," Arora says. "We were almost out of business doing both ... realizing they are very different operations--consumer-branded product vs. fresh produce--and we had to pick one to really execute." Today, Back to the Roots operates out of a 10,000-square-foot warehouse in Oakland, Calif., selling its DIY mushroom kits to 2,500 retailers internationally, including Whole Foods, Safeway, Home Depot, Loblaws in Canada and Three-Sixty in Hong Kong, as well as directly to consumers online. Revenue reached $1.3 million in 2011 and is projected at $5 million this year. Consumer purchases of the $19.95 mushroom kits through the company's website account for 20 percent of all revenue. To produce the at-home kits, Back to the Roots collects at least 40,000 pounds of used coffee grounds each week from 30 Peet's Coffee & Tea locations. This spared landfills 1 million pounds of coffee grounds in 2011; this year, Back to the Roots is on track to recycle 3.6 million pounds. Arora and Velez take pride in having grown their sustainable food business organically, without VC or equity funding. To date, their most substantial cash infusion has been $125,000 in prizes from business-plan competitions, including two worth $50,000. To help ensure their employees share their enthusiasm, the owners divide half the company's profits among the 31-person team at year's end. "It's a fun way to align everyone to the same goal," Arora says. "We're all growing together. We really want to build a lifetime, generational brand."